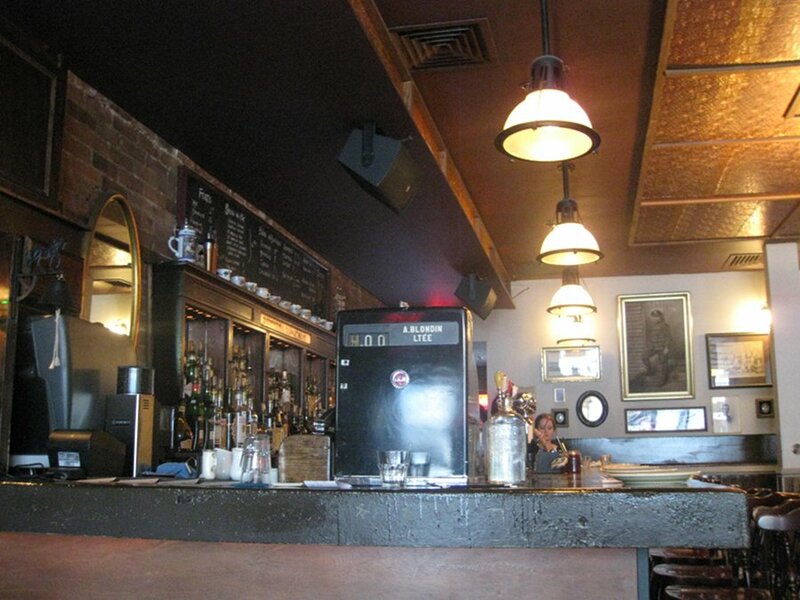 The sparrow has an amazing décor as it has lots of wood, a large bar, tall windows that light up almost half the place and a steamer trunk and a sofa around it. The feeling is definitely laid back and there was plenty of space available which is quite rare if you remember the good old days when you had to wait a while to get a table so you may want to move fast before people start coming back. I should also note that it is cash only which can be a pain if you haven’t had a chance to hit an ATM before your meal, so keep that in mind. The menu is unique to this part of town. 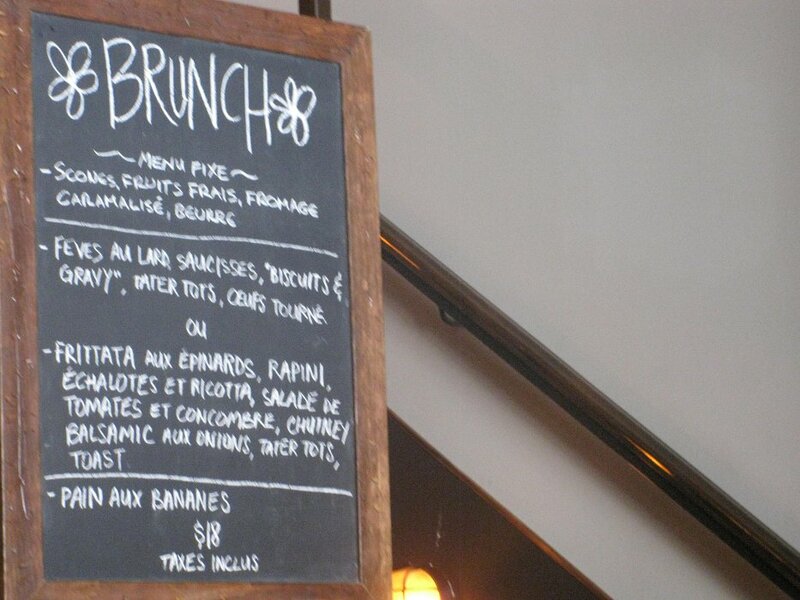 By that, I mean it’s an all-you-can-eat fixed menu setup for $18, tax included. Let me just point out that $18 for an all-you-can-eat spot is unheard of and what’s more impressive is that it’s a sit down all-you-can-eat; not a buffet. So how it works is simple. You have 2 options to chose from: they have the same entrée and dessert but the main dish is different where one is vegetarian friendly the other one is meat friendly. When you are done your first round, you can ask for more helpings of anything as long as it is what you ordered. So, if you ordered the vegetarian dish and wanted the meat one ,you can’t ask for the meat one, in theory, but you can simply ask the other person you are with to do it, which is how we did it. 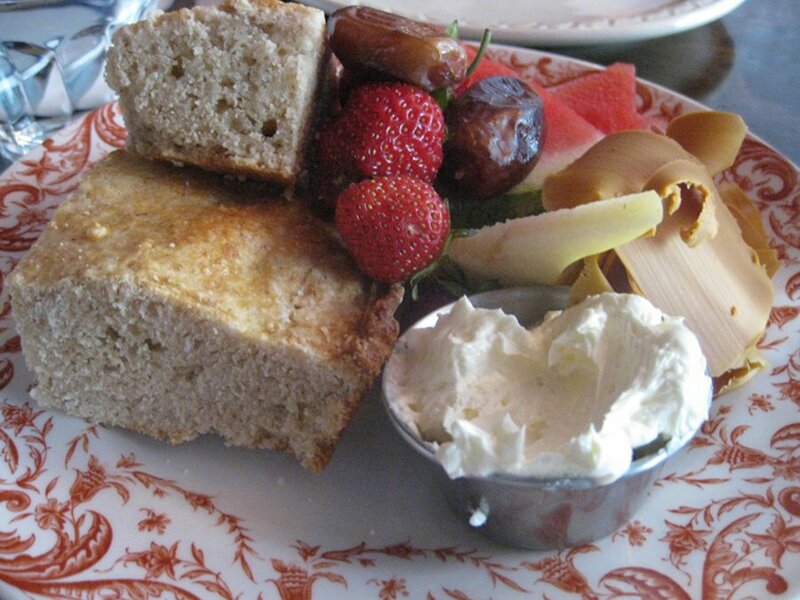 The entrée consists of scones, fresh fruit, whipped butter and caramel cheese kurds. There is actually an order to eating it which is important to know before you go. You need to take the scone, butter it and then add the caramel cheese kurds. You may be thinking that caramel and cheese kurds seems odd but you get the dryness of the scones mixed with the moistness of the whipped butter and the sweetness of the caramel and the cheese taste is barely present. You must eat it in this order or else you have a scone that on its own is too dry. This dish was quite unique and once we discovered the correct order, it quickly became a fan favourite (which by the way you can order again, and it is part of the price). The main dish options is where you get to make your choice. This choice was hard for me because I didn’t know whether to go heavy/meat friendly or light and vegetarian friendly. To help make your decision here is a breakdown of our two challengers. So in one corner is the meat dish which consists of baked beans, sausage, biscuits & gravy, tater tots and an egg over-easy. 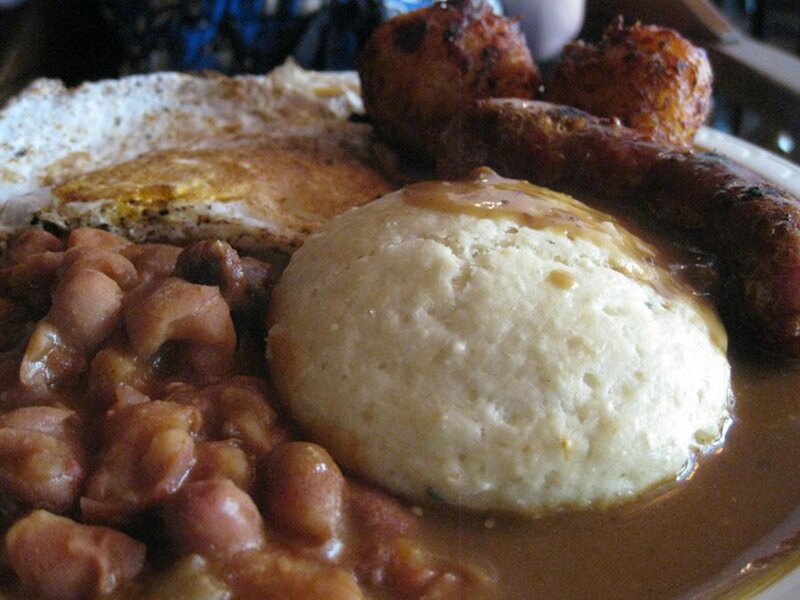 This heavy hitter can best be described as a home style US country dish. The biscuit and gravy is something that is very filling and has that USA country style feel to it. Now, before the concept of biscuits and gravy scares you too much, it’s quite tasty and moist and after we introduce its vegetarian challenger we will see how it stacks up. In the corner, wearing the green trunks, is the vegetarian option which is a frittata with spinach, rapini, challots, and ricotta cheese. There is also a tomato salad, a cucumber chutney topped with balsamic and onion, tater tots and toast. This dish is filling since the frittata is an Italian style omelette which is thicker and more dense than a normal omelette. You can really get full on this dish quite fast and the tomato salad is nice and refreshing but quite light and the tater tots make sure that, if by some miracle, you did not fill up on the frittata, you will with the help of these. Having to choose between both dishes, I would say the meat/country style dish is the best choice. It was filling and loaded with taste, not that the frittata was not, it’s just that every bite of this country dish made you come back for more. The banana bread dessert topped off our meal and came with whipped butter and a strawberry. This dish was not necessary since we were stuffed but it is included and neither of us wanted to waste good food. 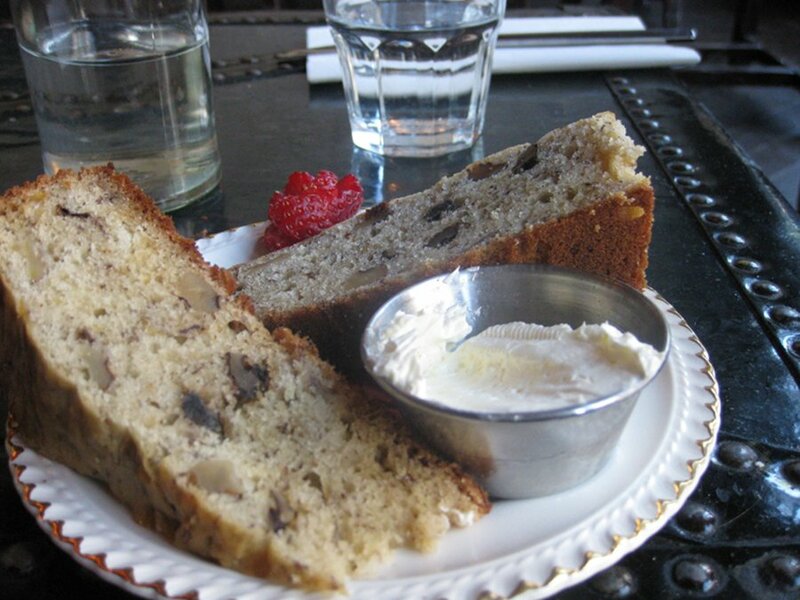 The banana bread was above average and was moist which is always appreciated. I did not find that it knocked off my socks but, I think that after having all that quality food and endless portions for only $18, it skewed my standards. The service was good and our coffee was refilled quickly. Our waitress was really sweet and did a good job explaining the menu . There is a vegetarian option and it is tasty and refreshing, not to mention filling. 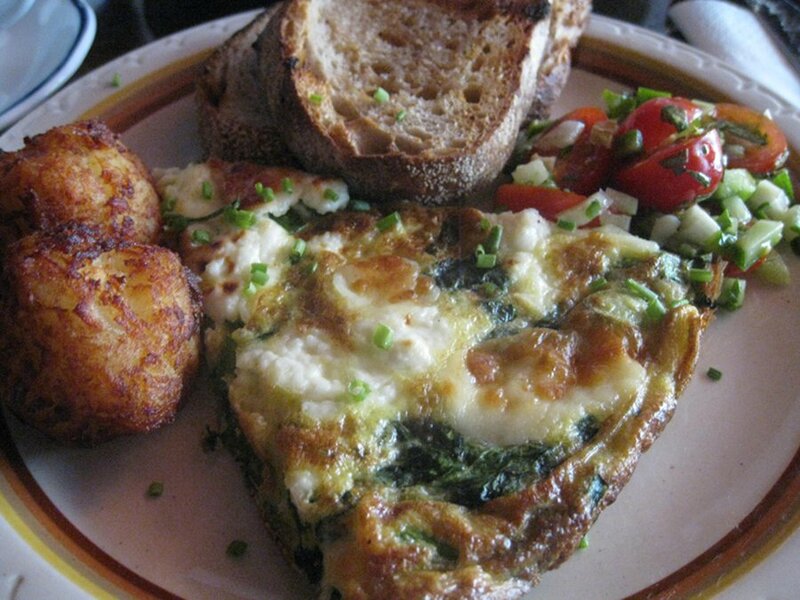 A frittata guarantees that you get full so it would be a great decision to use that. Sadly there are eggs in a frittata so the vegan dream of a vegan friendly all-you-can-eat brunch for cheap will have to wait. To say I liked this place is an understatement. I mean, the price is amazing considering the fact you get an all-you-can-eat sit down meal of quality. This is pure genius and I hope that people who hunger for large portions of good food will find their way here. If I think about it, I eat meals that are $15, before taxes, and don’t even include coffee so $18, tax in, is an amazing deal that must be shared. The taste of the dish is great and the entrée is unique and nothing short of brilliant. The main dishes are fun healthy and loaded with taste. Sparrow is bringing brunch back. I just went to the Sparrow brunch today and it was a huge disappointment. They never brought me my entree, didn’t serve fresh fruit on my companion’s, and the wild mushrooms in my vegetarian spatzle must have been frozen reconstituted because they tasted like rubber. Delicate wild mushrooms that taste like rubber! No flavour to the dish either. And the worst was the apple cake, a miserly piece of fridge-cold dry apple cake. Couldn’t eat it, made me so sad. And they never offered refills of anything. And for $18!! Sorry Sparrow, never again.